If you’ve blinked once in the last seven days, you may have noticed back-to-school is in fuh-ull societal swing. Haven’t felt it, yet? I dare you to walk into the mall this weekend, Texan friend. I just dare you. While you wait in that two hour line to save three dollars on pants, I’ll take your inward groan and outward eye roll as an unequivocal “you’re right, Robin.” Ahh. Nothing screams back-to-school quite like the literal cries of grade-school tantrums en masse ringing through the Target school supply aisle on the dawn of Tax Free morn. I have teacher/student friends/family a-plenty, and I almost physically feel your glares boring holes into my virtual face as I remind you of the inevitable winding down of summer vacation. For that I apologize, but full disclosure: I’m a little jealous (in more ways than one) of anyone heading back into the classroom this month. Maybe not so much of the midterms, parent conferences, tardy bells, or 20 minute lunches -but the one billowing, bright silver lining I would be rejoicing in if we swapped moccasins for a day: school supplies. The yearly appropriate hoarding of pristine pens and notebooks. Boxes of untouched colored pencils. Rows upon rows of empty planners just waiting to be color-coded. Anyone with even remotely the slightest Type-A tendencies have their own supply staples, and might find it slightly panic-inducing to stray. These picks are more or less a little superfluous, not so much basic, and wont infringe upon any of your supply traditions. But they’re fun. I saw this planner in-store and swooned –which is a pretty strong reaction for a planner. This is a-freakin-dorable and looks completely functional. Fun quotes, bright colors, pages of stickers, large spaces for writing. It’s lovely. If I was in the market for a larger planner or still in school, I’d have a winner. Because minimergencies are real. Take it from the tale of the spontaneous busted zipper in my skirt that was an absolute cherry on top of my mid-morning Monday this week (a well-fitting, not-tight skirt, I tell you!) Look at the kit. Or buy some safety pins. Do it. I wish I had. Logic: maybe if I had invested in a really cute one, I might not have had to replace so many in my life. It’s a nice theory. And 8gb? I could have really used that many portable gigs in my life during school. These are my guilty pleasure kinda superfluous kinda not pens. Because I was the kid in class whose guilty pleasure was pens. The short story: my journalism teacher got me hooked on them in high school. I share this single staple from my Type-A favorites arsenal as my happy-back-to-school parting gift to you. Enjoy getting hooked, too. Footnote: This post is technically “Back-to-School Top 10” because pending Tax Free Weekend in Texas + pending fall semester. I’m not a student or a teacher, but I just might not be able to resist snagging a few things off this list for my own office, because don’t we deserve to stock up on the fun office supplies now and then, too? Any of these pretties strike your fancy? 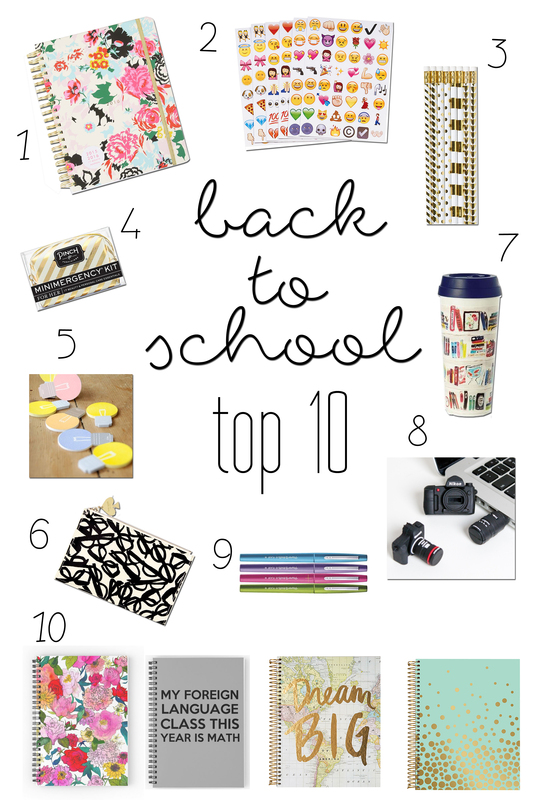 Do you have any other super fun back-to-school supplies you’re dying to buy? Care to tell me I’m the only weirdo who gets excited about this sort of thing? Comment below or with the talking bubble near the title! If I’m not mistaken, Kate Spade made a notable splash on this post. I’ve been drooling over some of her pens, but sadly, the reviews for them are awful. I don’t think I can justify spending $30 on a pen that isn’t loved by most. I’ve started a wonderful new planner. I actually use the page at the beginning of the month to write goals, because we should all have visible goals. Yes! Actually just 2 Kate Spade items, then some pretty nice look-alikes. 😉 I wouldn’t spend that either, ESPECIALLY without stellar reviews! These are all great for my wife and the kids, but this year we wen’t cheap and went o our local Print Shop and saved a fortune!